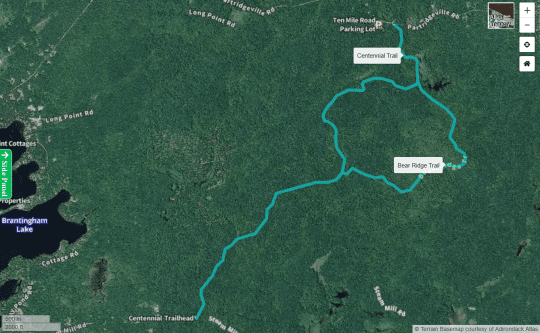 Centennial Recreational Ski Trails (4.9 miles), part of the Independence River Wild Forest, are designated for cross country skiing and can be accessed from the South Trailhead on Steam Mill Road or the North Trailhead on Partridgeville Road. Centennial Scoot Trail (3.2 miles) is the major through trail connecting the two parking lots. The trail gently rolls through mixed hardwood and coniferous forests from the South Trailhead. The trail intersects part of the old historic Glenfield and Western railroad system about 1 mile from the trailhead. 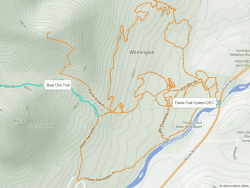 The Bear Ridge Trail’s southern intersection is located approximately 1.6 miles north of the trailhead, after which skiers will find themselves on a high bank overlooking a stream. The Bear Ridge Trail’s northern intersection is located 0.5 miles south of the North Trailhead. The section of trail between the northern trailhead and the Bear Ridge Trail includes some easy up and down hill sections and a steep climb/descent at either end of the section. The trail between these hilly sections follows the edge of an open beaver meadow, crosses an old beaver dam/man-made impoundment, and crosses two small bridges and streams. Bear Ridge Trail (1.6 miles) at its northern end drops down a small hill, crosses a bridge and then climbs a steep hill to the top of a knife-like gravel ridge (esker). The trail follows the ridge in a southern direction, providing views into spruce-fir swamps on either side. 1.2 miles south of its northern intersection, the trail intersects with the old Steam Mill Trail and turns sharply to the west. The trail is quite gentle for the next 0.95 miles to the southern intersection with the Centennial Scoot Trail. The trails can be used to form a 6.7-mile loop from the Steam Mill Trailhead or a 4.2-mile loop from the Partridgeville Road Trailhead. 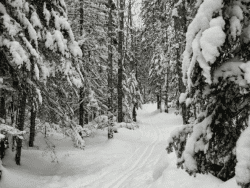 When traveling on designated snowmobile trails, skiers and snowshoers should be alert for snowmobiles. Move to the side of the trail to allow snowmobiles to pass. 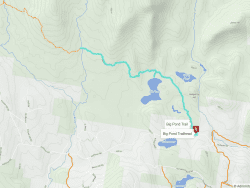 Map of Centennial Recreational Ski Trails courtesy Adirondack Atlas. It would be very helpful if you would list the nearest recognizable town so I don’t have to go to a map & look up the coordinates for location. Just click on the map. Also, it’s in the title – Brantingham.